With the roof replaced, showers remolded and the addition of cooling to the upper level, the Youth Inn completed it's first phase of renovations in 2014. The building also received new mattresses donated by Mattress Firm and Tempur-Pedic. The next phase of renovations was made possible in part to the Iowa Legislature for appropriating a total of $3.15 million to this renovation. In 2015, the Blue Ribbon Foundation received a $25,000 grant from Prairie Meadows through its Community Betterment Grant Program. The grant award helped complete phase two. These renovations included extended walkways that lead Fairgoers to new entrances on the north and south sides of the building. Updated fire alarm and suppression systems were installed. Handicap accessibility to all levels of the building is available with the new elevators. The Youth Inn’s third and final phase of renovations were completed in 2016. Replaced windows and improvements to the main floor and stage area in addition to an enhanced kitchen facility. New landscaping and a parking lot complete the north side of the building. 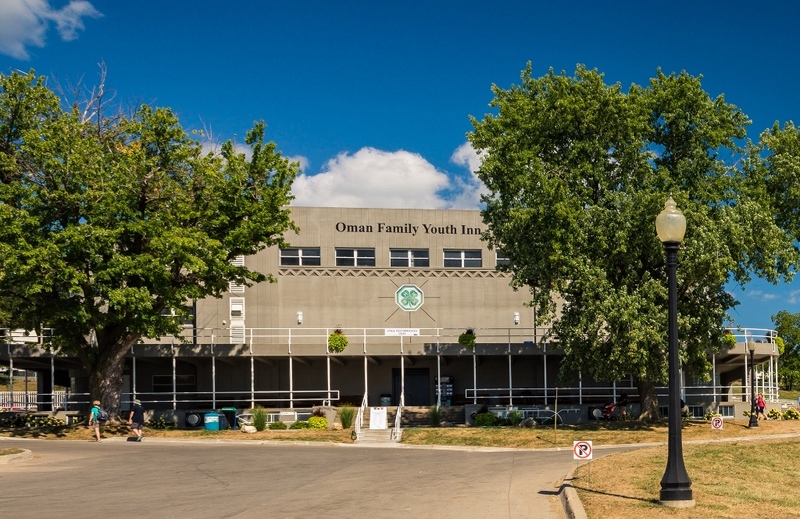 The facility was renamed the Oman Family Youth Inn for their generous $1 million donation for this important structure on the Fairgrounds.